We first encounter Pip in a desolate churchyard in the marshes, visiting the tombstones of his parents and five infant brothers, grasping that he is truly an orphan and alone in the world. Out of the bleakness, he is violently accosted by Magwitch, the escaped convict, who demands a file for his shackles and wittles for his stomach. The marshlands – wild, mysterious, apocalyptic – their silence broken only, on occasion, by the mournful horn announcing the escape of a prisoner from a convict ship, are an apposite setting to join two figures, forever thereafter intertwined, each with a moral compass more nuanced than would be initially expected. Few books begin with a first chapter as haunting as this. Dickens was a master at creating memorable characters, many of whom have become household fixtures – Ebenezer Scrooge, Oliver Twist, Little Nell. And then there were others, less well-known, whose names alone should buy them immortality – Wackford Squeers, the Reverand Septimus Crisparkle, Uriah Heep, Uncle Pumblechook. Scoundrel and angel, miser and spendthrift, judge and beggar, orphan and whore – Dickens could paint them all, some as comic caricatures, some as nuanced characters of profound complexity. Arguably, his crowning creation was Miss Havisham, the reclusive spinster, jilted on her wedding day, whose life is a memorial to that betrayal, timepieces frozen to that moment. She wanders her cobwebbed mansion in her moldering bridal gown, past the desiccated wedding cake on the dusty banquet table, plotting her misandristic revenge by grooming the icy Estella, her beautiful ward, to break the hearts of men (beginning, most notably, with Pip’s). Dickens was also a master story-teller. His books were serialized in weekly literary magazines, each installment being eagerly awaited by his enthusiastic audience. Great Expectations came towards the end of his illustrious career, by which time his craft was finely honed. Unlike some of his novels (“loose baggy monsters” according to the disdainful Henry James), Great Expectations is tightly structured. It melds all the Dickensian ingredients – gothic shadows and Victorian sentimentality, scathing satire and sympathy for the working poor, humorous parody and anguished tragedy, plot twists and social commentary, psychological depth and melodrama – into a really great story. Given a chance, children love Dickens, a chapter at a time, ideally read before a blazing hearth. Great Expectations is a perfect place to start. A Christmas Carol, Oliver Twist, and David Copperfield are good to follow. Voyage to the Bunny Planet comes as a sweet boxed set with three slim volumes. It deserves pride of place in every nursery library, as much for parent as for newborn, for it serves as the perfect introduction to the upcoming adventure. In each story, a young bunny child has a trying day. Take Felix in The Island Light. He suffers the humiliation of being sick in art class at school. The Soviet army-style nurse gives him scalding tea that burns his tongue. After a punitive visit to a doctor, he takes a distressingly icy shower. His parents, distracted by the malfunctioning boiler, neglect to kiss him goodnight. Janet the Bunny Queen soars down from her celestial kingdom and carries Felix off to the Bunny Planet. He passes through an archway and lives the day that should have been, described in rhyming couplets. On a small island, Felix and his lighthouse keeper father weather a storm in their snug home, make apple pancakes, play gin together before a fire. The comfort of the scene is palpable, as is the closeness of father and son. Of the 125+ books that she has written, Rosemary Wells said that Voyage to the Bunny Planet best describes her spiritual core. With wry humor and empathy, she presents a litany of the miserable or humiliating moments of childhood – each one of which strikes a chord of recognition. The alternate reality of the Bunny Planet captures the ineffable magic of childhood – harvesting the first warm tomato of the summer, helping the mother make a soup, falling asleep on a mossy forest floor, making toasted tangerine (“Place the sections on a log, directly in the sun. Wait until they’re warm and crisp. Eat them when they’re done.”) Rosemary Wells’ vision encompasses both the tribulations and the quiet joys of childhood, but the spirit of a benevolent world, here embodied by Janet the Bunny Queen, always prevails. Aside: Rosemary Wells is always on the side of the angels. She created Getting to Know You as a celebration of the glorious and timeless Rogers and Hammerstein songbook. Sing the songs and see the musicals – Oklahoma, Carousel, The King and I, South Pacific. From exuberant (“Shall We Dance?”) to lyrical (“When the Children Are Asleep”), from funny (“Happy Talk”) to poignant (“If I Loved You”), in the canon of Broadway musicals, it doesn’t get any better than this. Whether the toy is a twig doll with a hollyhock skirt and an acorn cup or a Lego figure from a Star Wars set, children like to enact their fantasies in a miniature world. Whatever the era, diminutive has always held fascination. There is a long chain of authors who have fed this interest in a parallel world of small, anchored at one end by Jonathan Swift. No one much remembers the giant Brobdingnagians, but the image of the tiny Lilliputians staking the sleeping Gulliver to the ground is one that stays. T.H White continued the Lilliput story in his imaginative Mistress Masham’s Repose. There have been a slew of other books of variable quality. But the queen of small people was clearly Mary Norton, the brilliant English writer who created The Borrowers. Pod is the hardworking straightforward father, Homily the anxious harassed mother, and Arriety the spirited and curious 13 year old girl. They live under the kitchen floorboards of an old Georgian house in the English countryside, home to Great Aunt Sophie, a bedridden invalid who enjoys a decanter of Fine Old Pale Madeira every evening between 6:00 and midnight. There was a time when the house was full of borrowers, but the shrinking of the human household was accompanied by the emigration of the borrower families until only one remains. They live by quietly garnering from their human hosts – tea, sugar cubes, and biscuits, silver coins for plates, a lace handkerchief for a bedspread, a Queen Victoria postage stamp to hang as a portrait, discarded letters to wallpaper the sitting room with the writing running up and down in vertical stripes. Arriety’s bedroom is made from cigar boxes, so her view is of feathery palm trees and chiffon swirled ladies. Their survival depends on their invisibility – only Pod leaves their home for his borrowing forays and the only human being who sees him is Great Aunt Sophy, who assumes their long conversations are a figment of her Madeira-soaked imagination. Their routine is upset when a young boy arrives, sent from India to convalesce from rheumatic fever. Arriety encounters him on her first borrowing expedition, and the consequences of their resultant friendship threaten the existence of the borrower family. They are forced to flee, and their lives are taken up in the sequel, The Borrowers Afield. Mary Norton wrote six borrower books over a thirty year period – this is a rare series in which the sequels do not disappoint. The writing is light and intelligent, the characters subtly complex, the details inventive, and the stories fresh and truthful. The Borrowers was awarded the Carnegie Medal and ranks among the top children’s books ever written. The English editions of all but the last in the series were illustrated by Diana Stanley, and it is well worth hunting for them. She captured the tone of Norton’s writing and the nuances of the borrowers’ often precarious life. The same cannot be said for the illustrators of the American editions, Beth and Joe Krush, who seemed to be overly preoccupied by Victorian frippery, a style that Norton did not countenance. There is much about the Holocaust that is unfathomable, especially to children, but the sundering of a child from a pet is a detail to which anyone who has loved a dog or a cat or a canary can relate. In Amsterdam, when the Frank family went into hiding in the secret annex, Anne had to take leave of Moortje, her kitty. Josephine Poole’s picture book biography recounts this tearful farewell. Anne was an exceptional child, with her fiery spirit and eloquent voice, but she was also an ordinary girl who led a life that would have been quite ordinary had it not intersected Hitler’s rise. She had an entertaining father and friends with whom she liked to see movies and a comfortable apartment and an affectionate cat – a life, in other words, that was similar to that of many children reading her story. Josephine Poole’s book is a good introduction to Anne Frank, and it is particularly valuable for providing historical context. What sets it apart are the evocative illustrations by the talented Angela Barrett. She is drawn to historical tales, which she illustrates with eloquence and an air of melancholy (see her Snow White, Joan of Arc, or The Hidden House), and her rich and somber watercolors convey the arc of Anne’s short life with a quiet intensity. Aside: “’We had a canary. When we received the notice that Jews are forbidden from keeping pets, my husband found it impossible to part from the animal. Every sunny day, he put the bird-cage out on the window sill. Perhaps someone reported him, because one day he was summoned to the Gestapo.… After living in fear for many weeks, the police sent a postcard stating that I must pay a fee of 3 Reichs-marks to pick up my husband’s ashes.’ Rupert, 1943.” Places of Remembrance. As an adult rereading Pippi Longstocking, I had an uncomfortable sense that I had encountered this character in another guise. Could it be? Lisbeth Salander, the punk, damaged, vengeance-seeking heroine of The Girl With the Dragon Tattoo? Both superheroines who bring their superhuman powers to the defense of victims, brute strength in the case of Pippi, computer hacking in the case of Lisbeth. Both outsiders, awkward in the world, unable to read the cues of adult interaction. Both intolerant of societal norms and human hypocrisy. Both orphans, effectively. Both redheads. As it turned out, I was right. Stieg Larsson was much influenced by his reading of Astrid Lindgren’s books during childhood. In his Millenium Trilogy, he named his alterego Michael Blomkvist after Lindgren’s boy detective series and he modeled his female feral warrior, Lisbeth Salander, after Pippi Longstocking. Neither Lindgren nor Larsson were accomplished writing stylists. Lindgren’s prose is wooden and there is no narrative arc. Pippi is a shallow personality lacking any trace of emotional nuance. She tells us at the outset that her mother died and went to heaven, and that her father, a sea captain, was swept overboard during a storm, a catastrophe referred to thusly. “And then this annoying thing had to happen.” Even when saving small boys from a burning building, she seems largely lacking in empathy. When she disrupts the school classroom, when she explodes onto the circus ring, when she taunts the mothers at the coffee klatch with their endless complaints about servants, she is relentless and does not know when to stop. Despite the irritatingly frenetic illustrations that accompany most Pippi editions, there is nothing particularly funny about her antics – rather, they elicit the same kind of uncomfortable embarrassment that meets an off-color joke. Perhaps this is most apparent when she manhandles two burglars into submission and forces them to dance the schottische with her. Hours later, exhausted, they slink away, and I am reminded of the analogous scene when Lisbeth wreaks her revenge on her abusive guardian. Despite the flaws, Lindgren managed to create a compelling character whose popularity has remained intact for generations of readers. The premise is admirable – a nine year old girl who lives an unsupervised life in the Villa Villekulla, alone save for a monkey and a horse. She is resourceful, independent, irreverent, self-reliant, unconstrained. She is at her best when she shares her unfettered life with Tommy and Annika, the children next door, and it is only towards them that she shows a modicum of affection. The book is at its best when Pippi leads them into a world of imaginative play that showcases her tall tales from her former seafaring life, her transformation of the ordinary humdrum into marvels of wonder, and her 90-degrees-off quirky way of doing things. What I remember from reading Pippi Longstocking as a child was something quite simple – her conferring of treasure status on found objects (“Lumps of gold, ostrich feathers, dead rats, candy snap crackers, little tiny screws, and things like that”) and her secreting her worthless valuables in a hollow tree. Funny picture books run the gamut: they can be zany, sly, silly, ironic, clever, joyful, nonsensical, slapstick. The responses they elicit run a comparable gamut. Surprisingly, there are relatively few great ones that elicit gleeful laugh-out-loud delight. Punch in New York, Lottie’s New Beach Towel, and Max’s Chocolate Chicken are three. A fourth is Grandpa Toad’s Secrets. Grandpa Toad and Little Toad walk through the forest. Confronted by a hungry snake, Grandpa Toad blows himself up to balloon size and the snake, intimidated, slinks away. He then outwits a hungry snapping turtle by tempting him with the prospect of a snake feast in lieu of a measly toad snack. But when he happens upon a humongous monster, Grandpa Toad freezes and he gets snatched up for the makings of a toad sandwich. Little Toad, in a genius move, grabs red berries from a plant and pelts the brute. Looking down with horror on the red spots erupting on his legs and tail, the monster drops Grandpa Toad and runs. This never fails: kids find this uproariously funny. There is the intrinsic delight in the child besting the monster, but the glee comes from the simplicity of the weapon – with harmless berries, Little Toad deceives the monster into believing himself mortally poisoned. Keiko Kasza’s watercolor illustrations capture Little Toad shivering with fear in his hiding place, then emboldened with outrage as he throws the berry grenades. Toads (like chickens) are intrinsically funny so the author chose her protagonist well. Kasza has written and illustrated almost twenty books, many of which involve a victim outwitting a foe through cleverness. My Lucky Day is one of the most inspired. A piglet arrives at the door of a fox. He enjoys a warm soapy bath (to get nice and clean), a filling meal with fresh cookies (to get fattened up), and a massage (to get tenderized). The fox, exhausted by his ministrations, falls asleep, leaving the rejuvenated piglet to skip off in eager anticipation of tricking his next carnivore. Obsessions with horses are stereotypically the domain of young girls. So Walter Farley was probably wise to create a boy protagonist for his exciting horse story, thus ensuring that his book would appeal to both genders. The adventure opens with Alec Ramsey on board a tramp steamer, returning from India where he has spent two months visiting his missionary uncle. At an Arabian port, a magnificent black stallion, wild and unbroken, is loaded on to the ship. In an ensuing storm and shipwreck, the stallion swims with Alec to a deserted island, thus saving both from drowning. As the two struggle to survive, a bond forms between boy and horse which persists through their rescue and subsequent life outside New York City. A retired jockey sees Black‘s potential as a racehorse and arranges for surreptitious midnight training sessions at the Belmont track. The story culminates with a special match race which pits Black against the two fastest horses in the country. Farley began writing The Black Stallion while in high school and published it while an undergraduate at Columbia: he was not much older than his young protagonist. The book is imbued with a delightful youthful naivete. What it lacks in deathless prose, it makes up for in spirited adventure. Farley grew up in the world of horse racing and he writes convincingly about the exhilaration of being on the back of a galloping horse, whether it be while skimming over the sandy beach of an isolated island or thundering to the finish line of a track. He also understood the importance of character, both human and equine. It is a deft touch to portray the dependent relationship between the high strung Black and the old swaybacked cart horse, Napoleon, whose presence is so calming. If The Black Stallion appeals, there are twenty more in the series. The Black Stallion Returns is particularly riveting since it moves the action to Arabia. It includes a ruthless one-armed villain, murder in the desert sands, blood feuds, Bedouin intrigue, and, as always, a climactic race. 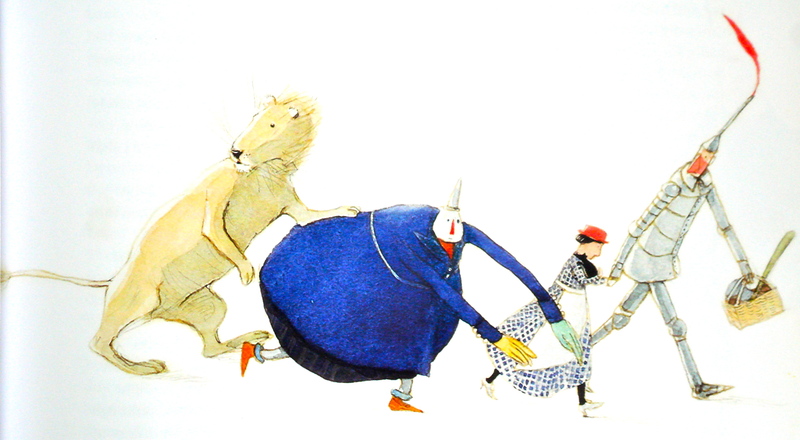 Keith Ward illustrated the original book, but many other illustrators have tried their hand. Note especially the lurid cover art by Harold Eldridge (The Black Stallion Returns) and Milton Menasco (The Black Stallion’s Filly and The Black Stallion and Satan). Dr. Seuss achieved fame for his children’s books, but he had a lesser known career as a political cartoonist for a left-wing daily where he railed against fascism. His political views colored his books, most overtly in Yertle the Turtle, which features a despotic character inspired by Hitler. The 500 Hats of Bartholomew Cubbins has a more subtle message which has to do with the arrogance of power. King Derwin looks down from his mountain-top palace over the castles, the mansions, and the houses to the distant farmer’s huts. Bartholomew, the unassuming son of a humble cranberry farmer, looks up over the houses, the mansions, and the castles to the palace. He has the same view as the King, only in reverse. As the King dashes through the town in his carriage, the townspeople hear the cry “Hats off to the King!” Bartholomew finds, to his dismay, that as quickly as he removes his hat, another appears on his head. The King calls in Sir Snipps, the royal hat maker, the three Wise Men, Yeoman the Bowman, seven magicians, and even the executioner – all to no avail. Finally, the nasty Grand Duke Wilfred, a boy himself, offers to push Bartholomew off a turret. As Bartholomew franticly sheds his hats as he climbs the stairs, they become increasingly ornate until the 500th has not only exotic bird plumes but a giant ruby. The King, delighted, offers 500 gold pieces for the hat and Bartholomew returns home, bareheaded at last. Dr. Seuss began his career with And To Think That I Saw It On Mulberry Street, a book that was rejected by 27 publishers. The title features the anapestic tetrameter rhythm that became one of his trademark meters. His second book, The 500 Hats of Bartholomew Cubbins, was unusual (in retrospect) in that it was written in prose, as were the two subsequent Bartholomew books, The King’s Stilts and Bartholomew and the Oobleck. Without the distraction of the insistent rhymed beat, the prose trilogy is distinctive for the originality and strength of the stories. Intersperse these with the gentle Horton books and the standards (e.g., The Cat and the Hat) that celebrate the extravagance of the frenetic imagination. All have in common the unmistakable high-energy Seuss illustrations that combine frenzied motion, zany humor, and improbable beasts (or hats). The 500 Hats of Bartholomew Cubbins appears more subdued than some because it is in black and white, with only the red hats providing a splash of color. We have, by the way, a college indiscretion (involving gin during the Prohibition era) to thank for Dr. Seuss’s pseudonym. Kicked off the Dartmouth humor magazine as punishment, Theodor Seuss Geisel adopted Dr. Seuss as a nom-de-plume so he could continue his submissions in disguise. Of German descent, he pronounced his name soice, rhymes with voice, until he was won over to the Americanized pronunciation, soose, which appropriately rhymes with Mother Goose. Eric Carle created The Very Hungry Caterpillar at the beginning of his career and it remains his most popular book. A caterpillar emerges from an egg and begins eating. Over the course of a week, he eats through a variety of fruits – one apple, two pears, three plums, four strawberries, five oranges – and then gorges himself on a sickening feast that includes an ice-cream cone, a pickle, and a slice of watermelon. Curing his stomach ache with a nice green leaf, he spins himself a cocoon and then emerges as a beautiful butterfly. With a minimum of fuss, a child has learned the days of the week, a few numbers, and the miracle of metamorphosis. A young child never ceases to be intrigued by the worm holes, just the size for a tiny finger, that go right through the foods on the page. The Very Hungry Caterpillar was the first of several “very” books which combine natural history, life lessons, and a multi-sensory component. The Very Busy Spider features the gradual building of a web, raised Braille-like on the page so there is a textural dimension. The Very Quiet Cricket ends with the realistic sound of a cricket chirping, while The Very Lonely Firefly includes the magic of twinkling lights. Carle avoids what in other hands might feel gimmicky by his obvious respect and wonder for the natural world. Carle’s illustrations have a deceptive air of simplicity. He creates collages with pieces of tissue paper painted with acrylic so there is considerable richness of texture and vibrancy of color. The technique, in his hands, is wonderfully suited to animals, insects, plants, and landscape. Less so to humans, who have calamine pink skins and thick legs. To see more of his art, visit The Eric Carle Museum of Picture Book Art in Amherst, Massachusetts, which also features rotating exhibits of the many gifted artists who have enriched the world of children’s book illustration. wrote the two Kay Harker books for children, The Midnight Folk (1927) and The Box of Delights (1935), and these are strange gems indeed. Kay Harker, like the author, is an orphan. Returning to his home and guardian for the winter holidays, he encounters a Punch and Judy showman on a station platform. This is Cole Hawlings, who gives Kay a message to deliver (“The Wolves are Running”) and the Box of Delights for safekeeping. The Box can make Kay swift or small, as well as open doors to the past. All of which comes in handy as he grapples with the nefarious and mercurial Abner Brown and his gang – their standard disguise is in the ecclesiastical robes of seminarians, but they can also morph into wolves or pirates or dive-bombing toy airplanes. The Brotherhood scrobbles (kidnaps) the Punch and Judy man, Kay’s beloved guardian, his friends Maria and Peter, the Bishop of Tatchester, and all the cathedral staff down to the choir boys. At the denouement, as the water is rising menacingly in the dungeon cells, it is up to Kay to overcome the sinister villains. And he must do so in time for the Christmas Eve celebration at the Tatchester Cathedral to take place at midnight. The book is richly complex with an inspired confusion of elements. There are unicorn-drawn sleighs, stags, talking rats and mice, fairies, Roman legionnaires, jousting knights, Christmas parties, carol singers, incompetent police inspectors, and innocent diversions like building snowmen or sailing toy ships a la Christopher Columbus. It’s an unusual mix but it all combines to create an odd off-kilter universe that accommodates the real world and the fantastic. Kay is the unflappable center – good natured, matter-of-factly courageous, intrepid, honorable, decent. Masefield’s genius was to combine Magic and Crime. What other master jewel thief can you think of who could collapse his soothsaying boy assistant (his head telescoping into his chest) to punish him for insolence? Masefield, with his poet’s eye, was a master of atmospherics. Try this. There is an uneasy eerie undercurrent of the ominous, the sinister, the creepy that runs through the story, but there are also passages of innocent delight. When read in December, it is a book that will give the reader the fantods on a wintry evening (as Peter would say) but also be a joyful harbinger of Christmas celebrations. The endpapers and the diminutive illustrations, provided by Masefield’s daughter, reflect this odd and original tone. “Jolly good chaps, the Romans,” Kay said. Do you have a favorite children's book? Leave your recommendation in a comments box. Copyright @ 2012 https://100bookseverychildshouldreadbeforegrowingup.wordpress.com All rights reserved.